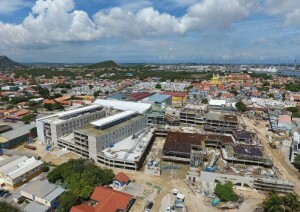 WILLEMSTAD - The Sona Foundation, which is in charge of financing the construction of the new hospital, must pay Ballast Nedam Infra B.V. compensation for not having the site ready on time. This is what the Court of First Instance decided in a lawsuit filed by Ballast Nedam. Ballast Nedam filed a lawsuit against Sona with the question whether Sona is bound by a decision of the Dispute Adjudication Board (DAB) earlier this year. The DAB has decided that Sona must pay compensation to Ballast Nedam for not making the construction site of the new hospital available on time. Sona refused to pay the compensation because it disagreed with that decision and submitted it to the Court of First Instance. In a summary proceeding, it has been decided that Sona may submit the problem to the Court of First Instance in a main proceeding, but that, as long as the Court of First Instance has not definitively assessed that case, Sona must pay Ballast Nedam in the meantime. The judge indicated that this is according to the contract. Sona had also argued that its position at the DAB at the time was not well defended by the former Berenschot manager and that it is therefore not bound by the decision of the DAB, but the Court of First Instance rejected that argument. Part of the claim is rejected because Ballast Nedam has not made clear how it came to that amount. For that reason, it was decided that Ballast Nedam and Sona each have to bear the costs of this summary proceedings.